Here is a typical letter, from October 31st, 2001, to fellow treeclimber Jerry Beranek, bringing him up to date on what I had been up to lately. Incorporated are two other posts from the archived treeclimbing.com message board. It is included here as a kind of snapshot of what the recreational tree climbing world was like at the changing of the millenium and the century. We then got together in January of 2002 and climbed the above redwood, the Reynolds Triple, which started off the most intense year of climbing big wood of my life. greenindustry.com/aa/2001/0401/0401wind.asp with his wedding plans. He built a treehouse wedding chapel, and was married in it last Saturday. I had the priviledge to help with the construction, which is cable suspension in a grove of Bigleaf Maple and Doug fir, and filmed the ceremony on the platform. The reception was a Halloween costume affair. Naturally, I wore my British Columbia flag loincloth, coconut shell bra, and wolfskin headress, leaving little to the imagination. I have been doing a few recreational climbs lately. Just came back from giving a couple workshops on rigging & climbing at the World Treehouse Association conference in Oregon www.treehouses.com . We put 14 people up in a pair of 186' Doug fir over a 3 day period last month. 5 of the climbers were from Japan, of which only 2 spoke English enough to be of help. The language barrier only caused minor problems. An example of a simple problem, is when one guy showed up in the top of the tree without a figure eight. Details, details. He hadn't thought through the process of how he was going to get down. The solution was to send spares up with the next group of climbers. BTW, a friend of theirs, John Gathright www.treeclimbingjapan.com said he ordered a CD and a book from you to be shipped to Japan. He is wondering when that order will arrive. I told him I would check with you on the order status. Out 'N About is looking to expand old growth climbing into a regular outdoor program. It's a resort that is located up against Siskiyou National Forest, so the access is just a short hike up the hillside. There is an even better tree up on the ridge, so I will be going back. We slept in several of the dozen elaborate treehouses. This place is just over the California border, within an easy hour drive of Jed Smith State Park. In August, I pioneered a climb up a 10' Spruce in the Olympic Peninsula with Dutch climber Jelte Budding. He was over here for the ISA conference in Milwaukee, where we were judges for the International Tree Climbing Championships (July 29th, 2002, this ITCC event will be held in Seattle, and you gotta be here! ). We plan on using this 250' spruce for a benefit climb for the ISA Research Trust with ArborMaster Training Inc. We raised $ 3,000 for the Trust by auctioning off a guided climb to the top of a rainforest old growth tree. The tree hadn't been picked out at the time, but this one is a beaut. It has a smaller diameter leaner that you can just step off of into the fat one. It's on Forest Service land at the end of the Bogachiel River trail road, just outside Olympic National Park. Dan Kraus & I also hosted ArborMaster principal Rip Tompkins up a 250' Douglas fir on the shore of Lake Crescent, which is inside Olympic National Park. Since then, I have checked with the feds, and found out they don't allow Big Shots or crossbows inside the Park. The use of a projectile is a no-no, it seems. This tree has a throwline set in it, for future access. This summer, I traveled down to the Valley of the Giants, on the central Oregon coast. Vern Esplin & I did a 275' fir, and he claims the adjacent tree we were looking over the creek at must be slightly over 300' feet. This is a pretty popular spot for rec climbers. I just installed Windows XP on my computer, so I don't have access to old emails. I can't remember if you were sent info about climbs this past winter & spring, so they are included. The grove of trees in a Seattle city park are amazing because of a Ship Canal that was dug back in the '40's or 50's that lowered the water level of Lake Washington 17'. An island in the lake was changed into a peninsula, because a strip of land attaching it to shore was exposed. The park is called Seward Park, and it is relatively undeveloped. Some photos are at: www.isa-msa.org/UFC/2001trip.htm and www.treeclimbing.com/wwwboard/messages/3320.html We invited the Urban Forestry Club from the University of Minnesota to climb in Seward Park. There was nine students and one faculty advisor, Tom Dunlap, who runs a private tree service in Minneapolis. Those ten people, plus five of us locals up in the pair of 217' firs, made quite an interesting weekend of climbing. I'll sign off here, and hope to see you again, soon, Jerry. 4 of us went up a 193' Douglas Fir today. We had an absolute ball, as there was over 100 years of climbing experience in the tree at the same time. Roger Barnett, Paul Sisson, Dan Kraus and yours truly were giddy with the prospect of not having to do a darn thing except watch Bald Eagles on such a beautiful Sunday afternoon. There was so much raucous laughter floating out over Lake Washington, you'd think there were a bunch of old retired fogies sitting at the counter at Denny's, drinking coffee. The Eagles left about a half hour after we arrived. After a late start getting everyone and WAY too much gear to the tree, we started shooting with the crossbow. After breaking the handle off the fishing reel, we settled on a low shot over a bark plate, a skinny live limb and a very stout dead stub about 125' up. A 2mm lime-line was pulled, then two, knotted-together pieces of 1/2" Blue Streak arborist rope were pulled up & over. One end of the Blue Streak was tied off and anchored at the trunk. Paul broke out a set of Mar-Bars, and Dan grabbed them and went up the free end of the Blue Streak single line. Once up, he reset the ropes solidly for those who would follow. About this time, with 2 of our 4 ropes used up, I realized we really did need the 400 footer that had been left out in the truck. After hustling out to get it, who would be found by the parking lot practicing throwline but one of the Caldwell boys, Rick. He was anxious to climb, but was late for our noon rendezvous when he had to run a friend who had broken his leg out to Olympia (a 150 mile round trip). Rick & I brought the 400' static line to the tree and sent it up to Dan, who was picking his way up the remaining 75 feet to the top. The long rope was set single for Paul, who was up next on the Mar-bars. Paul used 3 throw weights to hold the line down, and keep it from riding up with the cams of his ascenders. Rick received a short course on Figure eight decending, but due to time constraints, it wasn't in the cards for him to do much except manage the 2000 feet of rope laying around. Donning my shoulder harness, I stretched a Croll lower ascender between it and my Ness Saddle. Clipping the Croll and a Petzl Pompe on a dangling blue tail, I started jugging my way upward. I was met halfway by Paul, who was in the process of setting the long line double for Roger. Meanwhile, Dan had reached the top and had set his 220' orange Hi-vee rope for me to switch over to and continue my single line jug to the top. Meanwhile, Roger used the Mar-bars on the doubled long line to make a smooth, full-height ascent, passing Paul, who was heading on down. Sunset comes early in the Pacific Northwest, and we had a chance to watch a beautiful one tonite before sliding, one by one, down the long rope to earth. Waiting for us on the ground with Rick was Scott Baker, another ancient climber who had come by too late to consult with us on the resistance to gravity. We packed up our gear under headlamps and went to have Chinese food. Since such a blast was had by all, we left a line set and will revisit the site next Sunday at 10 AM, when we plan to set up a Tyrolean traverse to an adjacent fir that is even taller. It would behoove those that want to aquire or excercise ascending and descending skills to join the next Seattle Funclimb. We climbed two, 200 foot Firs today, and did a tightline traverse between them at the very top. This was part 2 of the Seattle Funclimb. Today was my birthday (at 49), and the same 4 climbers from last week made a real party out of it. The second of this pair of trees is 19' in circumference (6' DBH) and 215-220 feet tall. You may remember from last week's narrative that the other tree is 5' DBH and only 193' tall. A crossbow shot resulted in getting a 300' line set about halfway up the big tree, which Paul ascended with his Mar-bars. Meanwhile Dan had re-climbed the smaller fir, which still had a 400' line set from last week. He tossed his throw line 50 feet over, into the top of the big tree, them made a miraculous recovery toss with the Grapnel. He manipulated the CLG trebel hook and managed to snag the throwline, allowing the traverse line to be set at an upward angle, from about 177 feet in the smaller tree, up to 190 feet in the big tree. Dan attached his tandem pulley and began to haul himself sideways, till he reached the bottom of the catenary ellipse. With the slack in the tightline, he started out at a slight downward angle, then about midway, the rope bottomed out, right before the incline that began the second half of the traverse. About this time, 25' from either tree, Dan stopped and called out to get our attention. He needn't have, for Roger & I were both snapping photos furiously. Then I witnessed one of the most amazing things that had ever happened. With clear sky for 175' below, Dan lifted his feet up over his head and began spinning 'round and 'round. He spun 3 or 4 backflips, then, laughing wildly, flipped forward and threw 6 frontwards sea circles. He stopped for a second to experience the dizzyness, then started again, spinning backwards and forwards repeatedly. We were screaming hysterically on the ground, watching his childlike abandonment. He seemed like a 6' tall marionette, bouncing around like Pinocchio, when Gepetto sneezed. He exclaimed that this supposedly twist-proof 16 strand rope kept getting kinked up, so he had to untwist it by spinning in the opposite direction! Finally he stopped torturing us with this reckless infantile gymnastics exhibition, and continued his traverse to the big tree. I was pumped to get up and across the chasm. I stashed the camera and yanked on my New Tribe saddle. Slapping the Pompe ascenders on one end of the 400' static line, I made my way to the top of the smaller tree. Roger tied on his pro camera gear bag for me to haul, which came up as I lowered Dan's Mar-bars down to Roger. Roger got on the Bars and came on up. On arrival at the top, I found all Dan's surplus gear hanging on a daisy chain. I gathered up his jacket & gloves to deliver to him, since it was cold and sprinkling. I tossed a throwline over the gulch to him, which he lowered halfway down the tree to Paul. 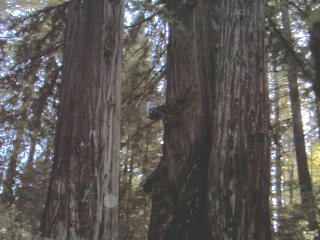 Paul was at the top of pitch where the crossbow had set the 300' line in the big tree. Another climbing line was tied on the throwline, which Dan hauled and set for Paul to ascend the rest of the way. As Paul jugged up his second 100' pitch on the Bars, I got set for my traverse to meet him and Dan in the top. I was somewhat nervous about stepping into netherspace, but with excellent support from Roger, who was right there with me, and from Dan and Paul, who were directly across this imposing abyss, I felt the inexorability of the anticipated, yet dreaded move. Resigning myself to the inevitable, I began the slothlike crawl, slung by my Pompe and chest ascender to the underbelly of the Hi-Vee tightline. Halfway across, Roger called a halt to reload another roll of film, so I took advantage of the break in the action to lay back, put my feet in the stirrups, cross my legs, and take a short snooze. Refreshed, I continued backing across the gap, until Dan was guiding me past the deadwood obstacles and into a soft landing on the other side of the tree-climbing world (dot-com? ). I took this opportunity to make a formal tree-top presentation to these three gentlemen, with a token of the high esteem to which we hold our tree climbing brethren around the world. Reaching into an inside pocket of the Gore-tex parka, I pulled out 2 cent Arbor Day postage stamps from 1932 in little ziplock baggies, and gave one stamp to each climber. These stamps were issued on the 40th anniversary of Arbor Day, so they're very special, and I thanked the guys for 'putting in their two cents worth'. It was getting dark, so it was time to head down. But Tarzan Dan decided to traverse back across the gully to meet Roger in the first tree. Sure to form, he goes ballistic on us and turns into the Human Dynamo again. This time we got some outrageous photos, since Roger & I were on opposite sides, and both slightly above Dan as he did his Whirling Dervish imitation. Dan & Roger made preparations to derig the traverse and rap out of their small tree. While I waited in the top of the big tree, Paul began his rappel, and he had to switch lines halfway down. It seemed like it was taking a long time for him to let me know that he was off rope, so it would be safe for me to follow. Actually, I couldn't hear him call out for me to come down, so I waited well into the dusk. Finally I got his attention and he notified me that the line had been clear. I began a double line rappel on a big-ear figure-eight with a 7mm prussik backup in the dark. Halfway down, I reached the transfer point where the other long rope was set as a single line rappel. Paul, Dan & Roger were already down and stowing the lines, when Paul asks me to attach a pilot throwline prior to removing the upper descent line, so that it won't risk wrapping itself in free fall around the many stubs and become stuck. I consider this, then take off one glove and start getting out my throw line from the bag at my belt. But, in the dark, I can't seem to find an end of the throwline. In disgust, I stuff it all back in the pouch. By now, I have lost my right hand glove, and have to switch to rapping down a 100' pitch on single slippery line in the rain. I pull the line and let it freefall. It falls free, without a hitch. One pitch to go, and I remember why eight-rings bother me so mutch. It seems to take forever, but finally, I'm on the ground, and all that remains is to find my Duo headlamp, and stow gear. Roger asks for some help pulling down the rope that I have just rappeled out with, as it seems to have gotten stuck. Guess whose fault that is? Luckily, he realizes that in the dark, he couldn't see that it was still tied off to the cedar tree that was used to anchor one end of it. He unties it and it comes down clean. We load up the gear in our backpacks, along with about 10 pounds of water per man, and hike out to the road, jubilant.